“Something spicy” got top votes in a recent poll on my Facebook Page (flavor to pair with chocolate), and I decided habaneros would be that something. (Note: Since then, “nuts or nut butter” has as many votes. More chocolate flavor pairings to come… Click here to vote or leave your suggestions!) 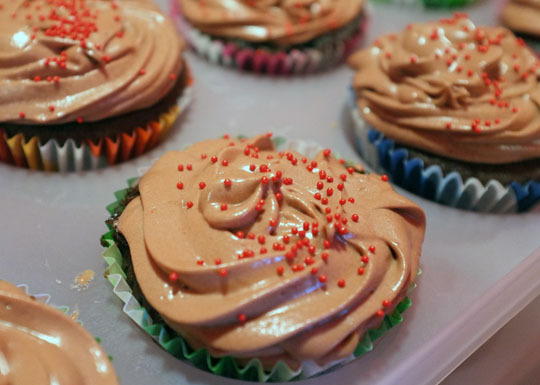 I’d done cayenne brownies before, but these were my first cupcakes to get a peppery spice. I decided to roast my peppers to bring out flavor and, maybe, tame the heat. I halved them, removed the seeds, and put them in the oven at 450° for about 7 minutes. For the cupcake batter, I put the habaneros in my blender (use a food processor if you have one, I don’t!) with 1/3 cup cocoa powder and 3 tablespoons of brewed coffee and blended until it formed a paste. I then used that instead of some of the chocolate in my favorite chocolate cupcake recipe. The icing (see recipe below) was very silky smooth and tasted great, but it was hard to pipe (too much half & half? my too-hot hands?). Once I managed to pipe the icing onto the cupcakes, it fell, but it firmed up in a short period of time so worked out OK. I finished by adding some red sprinkles, my little warning sign to the unsuspecting taster. I brought these to a post-half-marathon BBQ and a housewarming party that day, so I had plenty of taste testers. The first to want to try them were two children, and I worried they would be too spicy. The kids seemed to enjoy the cake, but mostly rejected the icing. Others also commented that it was the icing that was h-o-t (the grown ups loved it). I was surprised that the icing was so much spicier than the cake, as I put two peppers in the batter and only one in the icing. The cake did seem to have less of a kick. I actually thought all the milk fat in the icing would lessen the heat…and maybe it did, and this is the less! 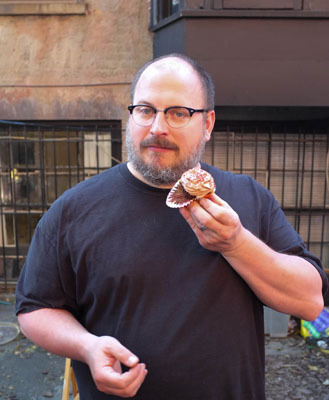 The cake or the icing, this cupcake left a decidedly spicy aftertaste. The hot crept up a second or two after the first bite. Luckily, they did not turn out too spicy overall. Maybe a more spicy cake would have sent them over the edge. I go for the spicy—and am certainly a chocolate girl—so I loved these! 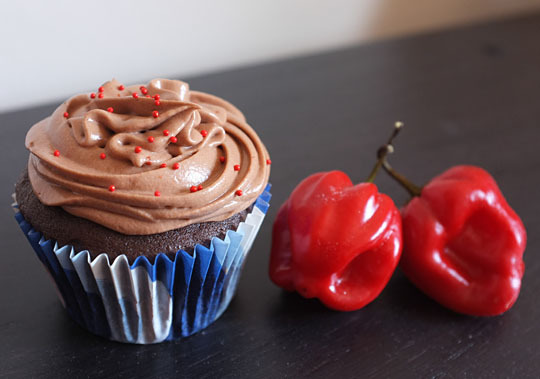 A friend, below, had suggested I make cupcakes with Scotch Bonnet a few weeks ago. I’d never heard of Scotch Bonnets before. 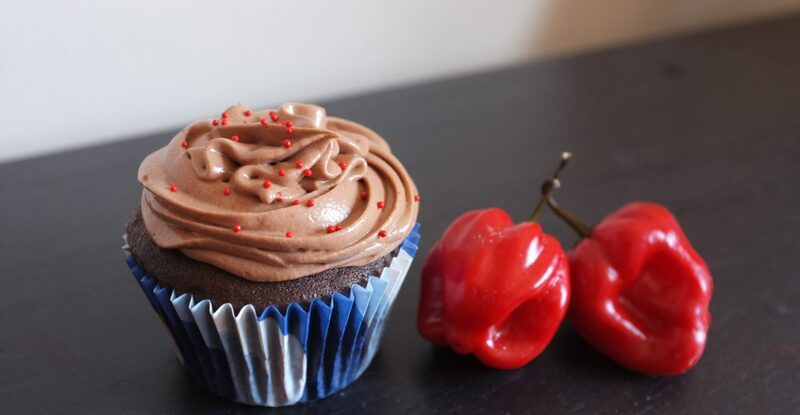 I thought, “Sure, I could try baking with Scotch sometime.” Then I showed up with these Habanero Cupcakes and he took credit for giving me the idea. What?! Well, kind of… My research has revealed much confusion on the topic. Some websites say the Scotch bonnet is a type of habanero pepper, others say they are “cousins.” What I used were sold as habaneros at a local fruit/veggie store, so I am calling them habaneros for the sake of this post. I have to say, though, comparing them to photos on the internet, they look a little Scotch bonnet-y. Who knows what they really were? Habaneros and Scotch bonnets are both Capsicum chinense, and they are both HOT, that’s for sure! I’d assume you could use either if trying to replicate these cupcakes. Mmmm, those look SO good!